This got me thinking as I prepare for our upcoming Certifications. Our previous workshop at Hustle Fitness Sydney, I broke the Ice with "Introduce yourself and tell us who your favourite Super Hero is". I know, I know you have probably been asked this question before, however I thought it was quite appropriate as 'Avengers' was on the TV the night before the workshop. More to the point it was one of the responses I was given that has stuck with me. The owner of the business said his favourite Super Hero was his Dad, which I thought was a wonderful answer and set the seen for an awesome workshop. My wife (Bec) has watched my journey grow over the past 7 years and my passion grow stronger and stronger for the DVRT system. Going back a little over 12 months, Bec not by choice under went major abdominal surgery. Little did she know that everyday lifting, movement and the things she took for granted became really challenging. Determined to get going again her first goal was in six weeks to get strong enough to get on a plane and fly for 20hr to the Arbonne International Conference in Las Vegas. After the first couple of weeks of rest we would spend 5-10 minutes a day on the floor completing ISO pull exercises to start activating the core. A simple movement using the Ultimate Sandbag and squeezing the floor with her feet was enough to active her tummy muscles. Making it to Las Vegas and having an AWESOME time, the next goal was hitting the sunny sandy beaches of the Gold Coast for the Australian Conference. This is where we started to really spend more time on movement and was able to start seeing big gain. Pulling the handles apart activated her lats and core, which allowed for a stable pelvis giving Bec the ability to start increasing the movement in her arms and legs. We have a running phrase at one of our ladies sessions 'Proximal stability, gives distal mobility', meaning if we work on strengthening the core and muscles closest to our spine our arms and legs will move more efficient. A huge stepping stone, creating tension to allow the legs to come off the ground. Adding the Ultimate Sandbag into traditional movements such as the Dead bug and the Bird Dog not only brings the body together to connect as one but gets us results faster. No we are not asking you to throw the USB's or move them really faster, in fact we are asking you to slow it down and create as much tension or friction as you can depending on the movement you are completing. Being able to use the core Ultimate Sandbag as a tool of feedback allowed tension to be achieved in the right places for a beautiful corrective exercise. Having a tool or piece of equipment is one thing, but knowing what to do with it to train and move with intent is another thing. That's why we are really excited that 12 months on Bec is now able to achieve what you see in the below video. It actually bought a tear to my eye when we were filming this workout because I would honestly say 12 months ago we had a vision and when it all comes together it is EXCITING. Not only can you use the Ultimate Sandbag for corrective exercises you can also put it into awesome workouts with true functional meaning. It's now your chance to take advantage and learn how you can train at home or in the gym. Reply to this blog and we will send you the education discount course code to apply to your next DVRT Ultimate Sandbag course. Click the image and check out or up coming workshops and certifications. Are your hamstrings really tight? One of the things I love about our Dynamic Variable Resistance Training (DVRT) system is applying our movements and exercises to clients and watching their reaction when they see and feel the change. Just recently I was approached by a local football club at a competitive level to come on board and work with them over their pre season training. A very fit bunch of young fellas finished off the 2015/2016 season just short of the grand final. A series of injuries let them down in the back end of the season. We approached the first training session and I was nervous.... what would they think? What would be the reaction? With 30 pairs of eyes staring at me, I took a deep breath and put our system into action. “SO hands up if you have tight hamstrings?” Was my first line. 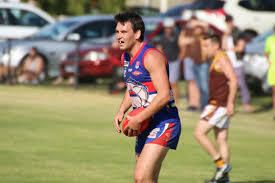 Now if you know Australian Rules Football (AFL) one of the biggest complaints in the sport is hamstring injuries or tightness. BUT IS IT THERE HAMSTRINGS? Yes I agree it is the hamstring that generally goes POP, but what would you say if I could give you two exercises that would assist this problem....... I know what I would say! So in front of 30 footballers we tested his range of motion, gave him one exercises the tall kneeling around the world. The full test can be viewed below. BOOM!! Jaws dropped and the reaction from the improvement in the range was awesome. I know, I know it hasn’t fixed the issue permanently. No it hasn’t but what it has shown you is to look further than the area of pain or discomfort. The tall kneeling position gives us not only a firm base to work with but a greater chance of core activation. The idea behind this movement is to teach the body to resist rotation or swaying from side to side whilst the USB is moving around the head. Driving the toes into the floor lights up our glutes whilst the upper torso is controlling and resisting the action of the USB. So what does it give us.....well with a core system activated and a stabile pelvis we have a platform ready to turn up the heat of what the year will bring. Now where: Work on your tall kneeling around the world, read more about the progressions here or even look to bring into your program the ultimate sandbag press out squat or resisted front loaded marching. Give it a go and let us know how you go. Check out our upcoming workshops where we will go into further detail of some of the most common DVRT Ultimate Sandbag exercises. Can bad shoulders be fixed? I slept in a bean bag for 10 days until I found relief! Seeing people in pain or discomfort is not something I like to experience because I remember when I did my knee what it felt like. Down on the coast if you don't ride a bike, run or walk the tracks you'll probably be one of the 100s that hit the surf for hours on end most days of the week. A gift we have to head out into the surf clear the head and set up our day. "Maintained"....... What we mean is when surfing for hours on end, just like sitting at your desk for hours over time your chest muscles tighten and begin to round your shoulders. We begin to loose up body mobility and the muscles in your back become over stretched and pain kicks in. For the surfer our deep stomach muscles called our flexors become extremely tight pulling on our pelvis and changing our stance. This can lead to balance issues and stress on other areas of the body! Below is a story of a busy mum and former pro surfer that one morning woke up and could not move her arm or shoulder. I am 39 years old and a Mother of two boys ages 12 and 10. I started surfing around that age and often spent hours and hours in the water at a time. Through my teen years I went on to surf at an elite level. After having kids and helping them learn to surf I was back surfing with them often hours on end to keep their pace …but probably not in the same body as I had in my teens! I started to notice I was getting sore in the shoulders, I was having trouble sleeping and felt like I had no power in my arms. I let it go for a few months as I thought it would get better! But it didn’t…it got a lot worse until one morning I woke up and could not move my arm even an inch. I was in excruciating pain I couldn’t sleep let alone drive , cook dinner etc. By chance I met someone that had fantastic results with Cam and she said go and see him even if he just helps you get some sleep. At that stage I had been sleeping in a bean bag upright for 10 days even on pain relief. After the first visit I was sleeping 6 hours straight lying down which I thought was very impressive. Over the next 6 weeks we worked with his specialised massage technique that slowly let the adhesions in my shoulder break down and allow me to complete a very simple strength and stretching program that I would do at home which took about 10 minutes a day. I could not be happier with where I am now which is full range through my shoulder and no pain at all (that all went by week 2). I have purchased an ultimate sandbag and now complete my rehab program at home. I love the USB Arc pressing, around the worlds and now working on my max lunge and haven’t felt so good through my shoulders in years. Well it wasn't our first exercise but what it did lead to was our go to as it was opening up her flexors, challenging the frontal plan stability required to ride a surfboard and then bang for her buck strengthening those shoulders. It took us several weeks to undo and release all the tightness and tension before we could move into our strength program. Anna's success has continued and now enjoys teaching and surfing with her boys. Are you struggling with the same problems? Check out our upcoming DVRT Workshops where we will show the Arc press and more. Working in the fitness industry, as a lot of fitness professionals will know it can be a life changing experience for our clients and on the flip side and extremely rewarding position for us. You get excited when you see your clients achieve and reach mile stones and you definitely feel for them when....it just doesn't work out for them on the day. We've all heard the phrase, "you need to get back on the horse". Well when we have a set back in life sometimes it's not that easy. We can push and push and push our clients to give it another go but at the end of the day, it takes determination to 'never give up'. Recently posted on the Ultimate Sandbag Fitness Facebook page was the above image our photographer captured of myself and a client training in the 4EVERfitness training studio. To the naked eye this image is of a coach and his client completing an Ultimate Sandbag front loaded squat, but here's where an image can mean so much more. Born with a congenital orthopaedic issue where his femur or thigh bones are internally rotated or both of his knees face inwards. Specialists said to him as a little boy the option of surgery would mean breaking his hip, resetting and being wheel chair bound for 12 months with the potential oflearning to walk again. Opting out as a young boy he played high level cricket and followed his passion basketball. 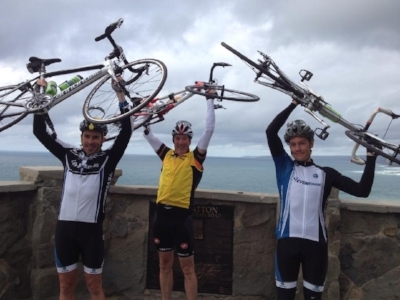 Knocking his knees together when running and riding, he was not able to perform at his best, let alone knee pain and tightness through his pelvic muscles was never ending. As time when on he learned to deal and adapt with his issue and for years as a young adult would train himself at home on a multi function weight machine. I approached him a little over 12 months ago and asked how his training was progressing. To my surprise he said, “Great, I have been maxing out my machine for 12 months”. “WHAT” I replied. I was shocked to hear he had stayed at the same weight for this long. He went on to tell me he would love to run but it caused him pain and as his weight training didn’t cause him grief he wanted to continue. I could read in his face that he was frustrated and wanted change. He was stuck and didn’t know what to do. So what did we do! We set up a plan and introduced him to functional training. Being a DVRT Master instructor, I felt confident that using the DVRT system we could create some pretty amazing changes. Setting up a plan of progressions, identifying and addressing his specific issues we got to work. Did it work? Well here he is today and what a difference. Wait! The real question is what HAS changed. As you can see from the picture above this is Dan’s very first ½ marathon in 36 degree C temperatures, he’s completed a 10 day charity ride from Adelaide to Ocean Grove a little over 1000km and best thing yet is he has shot over his weight limit of 60lb in the Ultimate Sandbag Clean and Press Challenge knocking out 40 reps at 80lb in 5 minutes. Writing this blog gives me goose bumps thinking of how far he has coming and the hurdles he has jumped to get him to where he is today. The take home message here is have a vision, voice it and listen to your client. We all get hooked up with the latest fads and crazes and forget to listen to number one.....the clients goal. What DVRT Ultimate Sandbag Training has given me is a great possibility of leading my clients down a path of success. An ability to more accurately and effectively identify their needs and address them. Having great will is part of the equation, having the right know how is the other! Until next time train safe and with purpose. 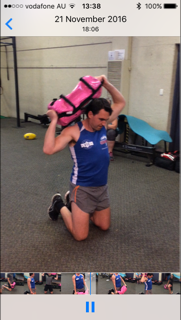 Can you really use a sandbag to fix an injury?? As we sink our teeth deeper into the health and fitness industry it becomes more and more noticeable that it takes a team to fix a problem. Having an issue looked at from all angles and levels goes a long way to educating your client to a better outcome. About two months ago I wrote a blog telling my story of how I over came major knee surgery to running a marathon (Read Here). Well the story continues with a success story about my wife and best friend Bec. Bringing two beautiful children into our lives and setting up a functional training centre from home was the best decision we made. Not easy but a great way to watch the kids grow up and allow them to see what it took to get mum pain free and moving. Two years ago!! !, Yes two years, Bec is now on track to getting back to her passion of running. Without getting to gory Bec had a dislodgment of her pubic bones and would find it hard walking or even moving around to complete her day to day activities. Working with Bec’s Chiropractor we took to the studio and worked through the DVRT system using the Core and Power Ultimate Sandbags. Now keep in mind kneeling or putting any asymmetric load through the pelvis was painful, which is why we started with glute bridging movements. We wanted to fire the connection between the lats and the glutes to allow us to progress to more powerful movements later on. Once we could achieve fluid movement through bridging patterns we advanced to cross pattern loading with one of the movements the bird dog. What we found interesting about this movement was when executing the traditional bird dog pain was experienced through the lateral hip. 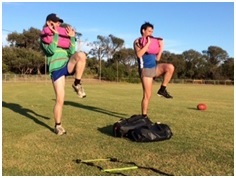 However when introducing the lateral drag bird dog using the Core Ultimate Sandbag the pain disappeared. Huh! No pain! There must be a trick and why would this take away the pain. Well what we did different is by dragging the Ultimate Sandbag along the ground it light up the lats and connected with the opposite glute giving us the cross pattern connection. BOOM follow the make and design of the body. Like our walking or running patterns we move in cross patterns with the opposite arm and leg tracking forward as we move. Training the body as it is designed to move, not shockingly, improves strength, movement, and pain-free actions so much faster! This is different than how most people perform a Bird Dog. They create the same motion, but the intent is quite different. There isn’t the tension and connection to this chain that automatically “turns on” the right muscles! Having an understanding of movement and how the body connects and communicates will go a long way to achieving your clients goals of pain free movement. It’s a very humbling feeling when your client once struggled to stand on one leg to moving through the below patterns.